A stinky microwave is exactly the sort of appliance you don't want to use to heat your next meal lest that odor gets into your food. A burnt smell in the microwave can linger so long that it practically begs you to do something about it. Thankfully, a thorough steam treatment with vinegar and water is often enough to do the trick. The easiest way to get rid of that nasty odor is to deal with it right away. Open the microwave and inspect the compartment to see if any burnt foods or sauces have spilled or splattered. Check the ceiling of the microwave as well; sometimes food splatters upward. When the inside surfaces are cool enough to touch, wipe down the inside of the microwave with a damp but not soaking wet dish cloth or sponge. 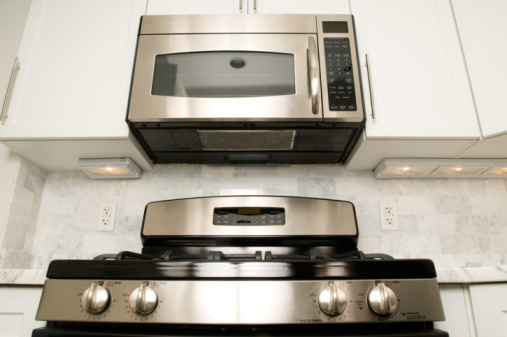 This process helps prevent odors from staying in the microwave from one use to the next. Leaving its door open for a few minutes after cooking also helps rid the device of food odors, even if you've burnt popcorn in the microwave. Vinegar is excellent at removing household odors, especially those lingering in the air. Fill a small glass measuring cup halfway with water, topping it off with a few tablespoons of white vinegar. If the burnt odor is strong, feel free to increase the percentage of vinegar in the cup. Microwave the liquid for 90 seconds or only until the liquid just begins to boil, forming steam on the inside-facing portion of the appliance door. Turn the microwave off if any time remains and leave its door closed for several minutes, allowing steam to coat and loosen any undetected bits of debris. Open the microwave door, carefully remove the measuring cup and then wipe down the inside of the microwave with a clean, damp cloth or paper towel. The burnt odor should be gone as well. Any lingering vinegar smell dissipates within a few minutes. If you don't care for the smell of vinegar, water and a lemon steam the microwave just as well. Pour half a cup of water into a microwave-safe glass bowl or measuring cup. Squeeze a sliced lemon into the water, and then put both lemon halves in the water too. Heat the bowl or cup just long enough to create steam, usually 90 to 120 seconds depending on your microwave. Leave the microwave door closed for several minutes, and then open the door and remove the bowl. Wipe down the insides of the microwave with a damp cloth. Once the lemon water cools, it can also be used to wipe down and freshen the inside of the microwave. Save that lemon water after deodorizing the microwave and use it to add a citrus aroma to the air as it destinks the kitchen. Place the cooled liquid and lemon halves in a saucepan, simmering on low until steam forms. Simmer for an hour or so, keeping an eye on the pan to ensure it doesn't run dry. Feel free to add more sliced citrus fruit and water to the pan if you enjoy the scent. Once the lemony water cools, feel free to use it as a household cleaner and disinfectant. Dip a soft cloth into the liquid and wipe down kitchen appliances, door handles and other nonporous surfaces around the home. The vinegar and water solution works just as well for cleaning household surfaces. Use the cooled vinegar solution to wipe down the refrigerator or glass windows and mirrors. Brew a pot of vinegar water in the coffee maker without coffee to remove stubborn mineral deposits inside the device. Run a brew of plain water afterward to rinse the coffee maker.